If you’re thinking about purchasing a pasta extruder, you might want to take a look at this. First of all, look at those beauteous dies. The variety of fresh pasta you can offer with Arcobaleno Pasta Extruders is unmatched. 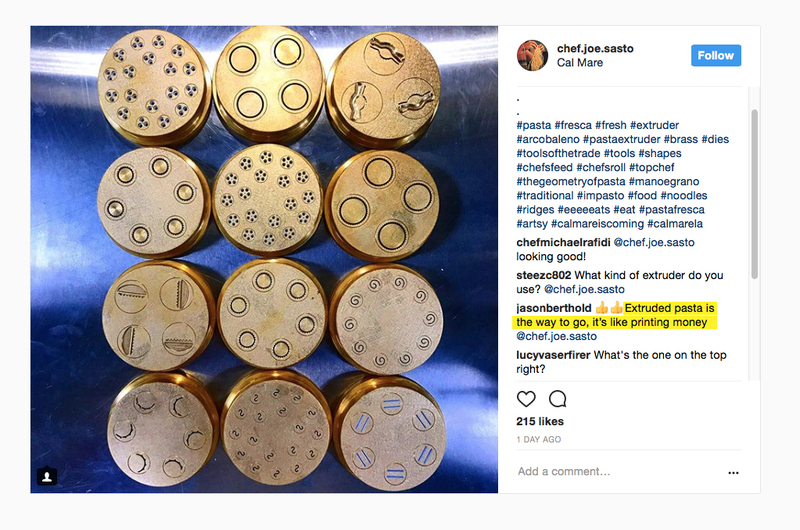 With over 100 dies to choose from, there are so many “pastabilities.” But more importantly, as @jasonberthold mentioned on Instagram, “Extruded pasta is the way to go, it’s like printing money.” This isn’t the first time, nor will it be the last time we hear this. So many of our chef’s give us the feedback that these extruders are practically printing them money. The AEX18 Extruder pays for itself in under 60 days! Some chefs have told us they paid it off in under 30 days! Now THAT’S printing money!